What’s the best way of extending the life of your guitar strings? The answer is simple: Keep them clean. Wiping them down after each play not only extends the life of your strings, it makes them play better too. There are dozens of products out there that not only clean but also lubricate them, helping you play faster. In this article, we’re going to look at the best products out there. What is a String Cleaner? Cleaning and regularly polishing all parts of your guitar is the key to keeping it fit and healthy. As for guitar strings, they have a relatively short life-span once they’re strung on your guitar; this is mostly dependant on how often you play, it could be every 3 to 4 months if you play only a couple of hours a week, or every couple of weeks if you play four hours a day. Specialist cleaning products like the ones we list here remove the natural build up of ‘gunk’ – dirt, grease, and sweat – not only preserving the life but making them sound and play better. Remember, you should also condition your fretboard with oil every so often to keep the essential oils topped up. You may be thinking ‘why can’t I just use a cloth and some household cleaner’? Well, you could, but if you value your instrument and care for its longevity, you won’t. For a start, your average household cloth is cotton based and will leave bits of little fluff on your guitar that you’ll be cleaning off for weeks. Worse still, this debris affects your tone. As for a household cleaner, your guitar is made of premium grade wood; wiping it down with something you’d use in your kitchen, or furniture polish, will dry out the natural oils in the wood. But as I said in the intro, guitars aren’t meant to last forever. You can’t preserve a set of strings for years, however clean you keep them; so the switch them out at regular intervals anyway. But getting in the habit of keeping them clean while they’re on your guitar will have a big impact on the tone and even speed. So what are the key considerations when buying one? Top only – cleans the top of the strings only. This is the quickest to apply, as you just need to whip it out and run it up and down the length of the fretboard. They don’t clean 360° though. 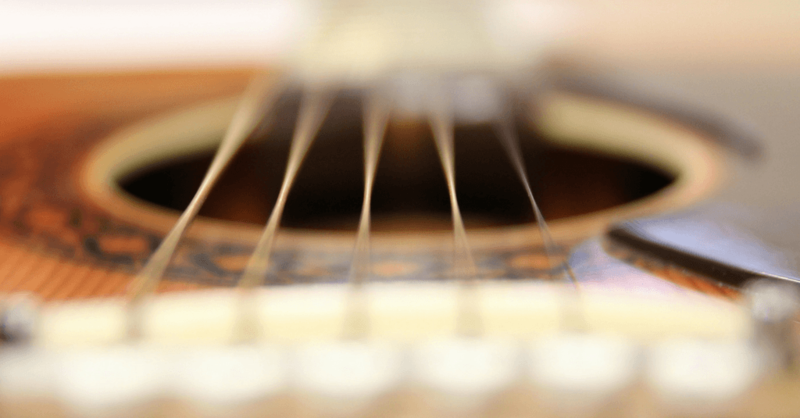 Top and under (clamp) – as well as on top, this style cleans under the strings (360°) too, cleaning both the upside and underneath. They are a bit fiddler though, as they need mounting and locking into place. They’re the most effective cleaning method though. Traditional spray – the stuff you spray on and work with a cloth. By far the messiest and most time-consuming method of application. Some of these products come with a cloth to help with excess liquid. Lint-free, microfiber cloths are preferable as they need no fluff behind. Loopy cotton also dampens the sound, so to be avoided. Finally, while all products will improve the playability of your guitar, some position themselves as lubricators as well. Lubricators are especially useful for heavy metal (shredding) and fast soloing in general, and will also help to reduce any fret noise. Ok, let’s look at each product in more detail. 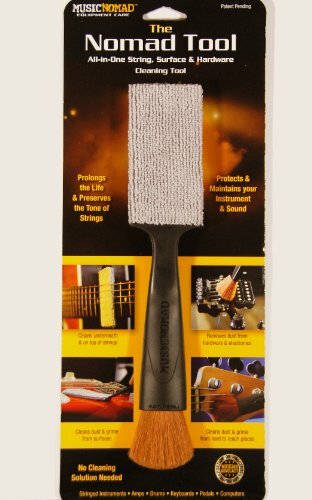 Ok, this looks a bit like a makeup brush, but it’s a very tool for cleaning your guitar and various other bits of musical gear. Yes, it’s just a soft brush and a piece of cloth mounting on a plastic stick, but it’s very handy. For a start, the ‘paddle’ end has a washable microfiber pad that’s a top and under cleaner, so it gets to more of the strings. Flip it around, and you have a super soft to dust build-up of dust on body, bridge, saddles, headstock, you name it. The only downside is it’s hard to reach past the second or third fret because nearer the nut of the guitar, the distance between string and fretboard is narrow. 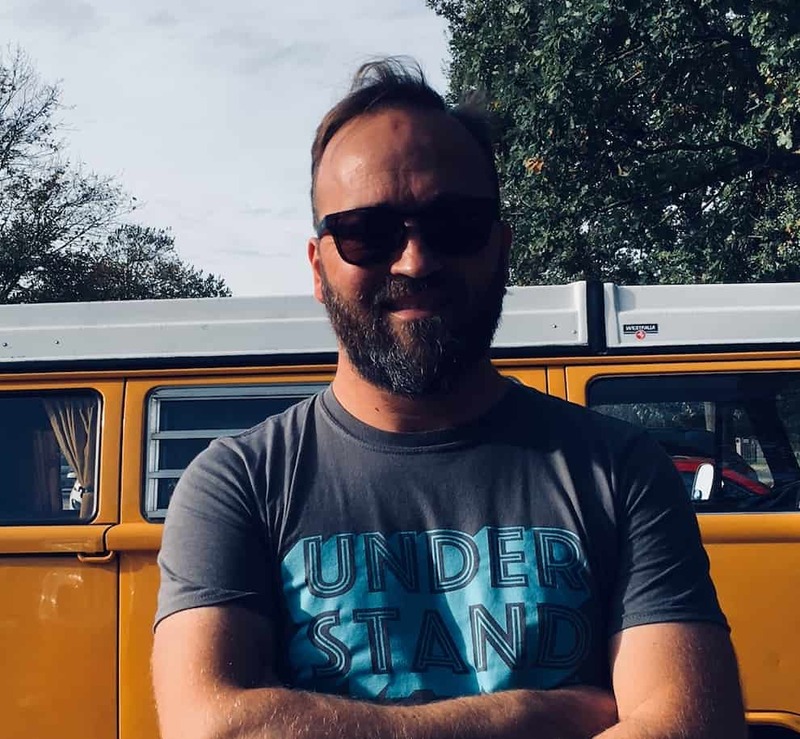 The build-up of gunk is mainly from the second fret down, so you should be ok.
I’d be surprised if you haven’t come across Fast Fret already, as they’ve been a market leader for years. It’s designed as a string lubricant that helps you play faster, but also features here because it includes a cleansing solution too. The application is easy and comes with a cloth for wiping down an excess liquid. It’s primarily a lubricant (hence the name). Some people prefer just a cleaner, claiming that lubricants have an undesirable effect. 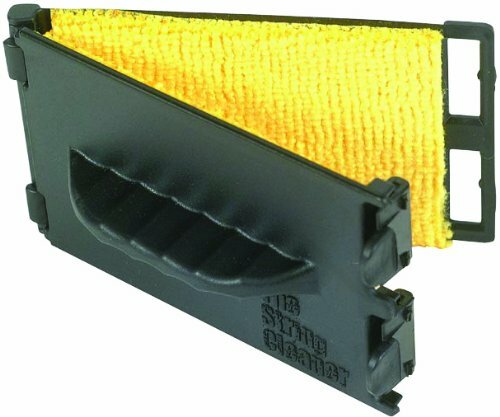 Cleaning the underside of strings is always a bit tricky – this device gets around that problem very effectively. It’s a clever little clamp that fits around (above and below) your strings for 360-degree cleaning. Once locked in place, you move it up and down the fretboard to clean along the entirety of the fretboard. The cloth is removable for washing but doesn’t come with cleaning solution so you’ll need to buy some separately (such as the Kyser product below). Designed to cover both sides of the string. Not the quickest solution for a quick wipe down. You’ll need to apply a cleaning solution. The second product on our list form Music Nomad is a top only applicator and includes a lubricator, to rival Fast Fret or Planet Waves’ XLR8. There’s reasons to like this too. Firstly, the applicator is the full width of the fretboard so you get an even spread. Its ergonomically designed for easy application, and rectangular in shape and includes within it space for removable cloth to remove any excess oil. The cloth is lint-free too, so you won’t find any leftover fluff after using it. Ergonomic applicator covers the width of the fretboard. Blend of naturally occurring mineral oils. Finally, the last on our list is another cleaner and lubricant – this one is the XLR8 from Planet Waves. Coming in a robust little tin that’s reminiscent of shoe polish, it’s a handy little tool. As a top only product, it’s limited, but for speed of application, it’s a good option. As a lubricator, it also removes friction for faster playing, so will appeal to fans of Fast Fret. The only downside, is you can’t evenly apply it across all strings. This product from Kyser is an old school guitar cleaning solution that you spray onto a cloth. 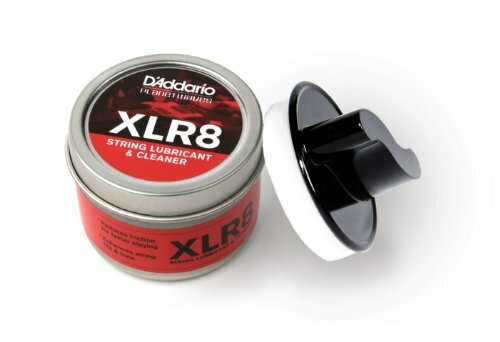 As a lube, it also makes your strings smoother and easier to play. While the application method isn’t as advanced as the others on this list (it’s just a spray), you can use this in conjunction with top and under (clamp) products like the one from ToneGear. Some claim that lubricators can dull the tone of the strings. Need to use with a cloth. For top only, Music Nomad’s MN109 takes first prize for its ability to cover the entire width of the fretboard. 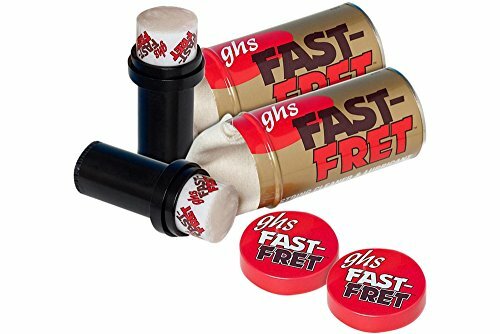 Fast Fret probably has the biggest reputation of the lot, so you can’t go wrong it plus the metal canisters are hardwearing products too. 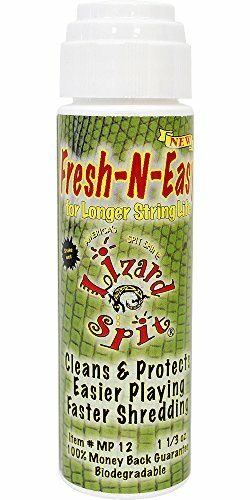 If you want to try something a bit different, Lizard Spit’s Fresh-N-Easy is a new kid on the block, and this product is super tiny for sticking in a pocket for pre or post gig lubrication. For the top and under ‘clamp’ style, Tonegear’s is the only one to consider. And for a lubricant that works well with it, try Kyser’s String Cleaner.